Wide Span Shelving – Canadian Rack Inc.
Canadian Rack is VAR for Metalware wide span shelving. Wide span shelving is designed for hand-loaded, medium to heavy loads. It is ideally suited for storing small stocks of many different product types for person-to-goods picking. The system is accessed on foot, either at floor level or from elevated walkways fitted between racks. Ideal for record storage, Wide span’s dimensions are in line with standard archival box sizes. Available accessories and components of Metalware wide span storage racks can adapt your system to a broad range of pick ready warehousing requirements. 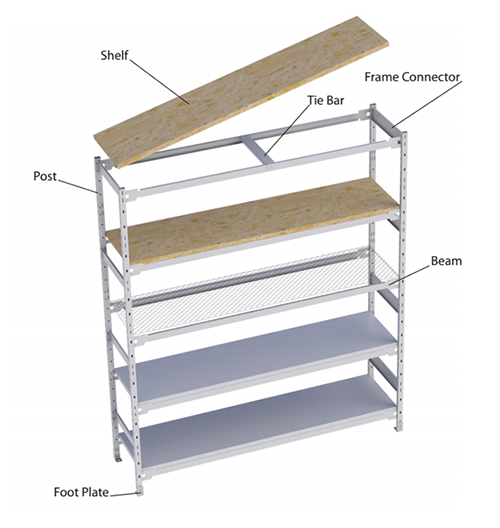 Pair this rack solution with stairs and catwalks to create multi-level storage, maximizing the height of your installation.